The Peak Alone Fire Trail offers access to one of the finest coastal views on the south coast of NSW. Peak Alone (Wandella) at 957 meters elevation and only 25 km from the ocean, dominates the local landscape and provides a 360 degree panorama of mountain, farmland and coastal scenery. This 80 km trip starts in Cobargo and is mainly on good forest roads. 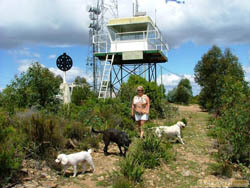 The last 2km to the fire tower requies low range to traverse a rock strewn, rutted and steep ascent to the viewing area. The initial 1200ft decent off the top of Peak Alone is narrow,very steep and loose also requires low range and in my case with a 3300kg 80 series, low low, in order to steady the rate of descent. The remaining 2000ft decent to the Tuross River is on good forest roads. The river crossing is easy at low water levels. There are excellent camping sites nearby, with perfect swimming holes and bass fishing in season. The return to Bodalla has many alternatives to the track file shown.